I live in the 3rd Congressional District. 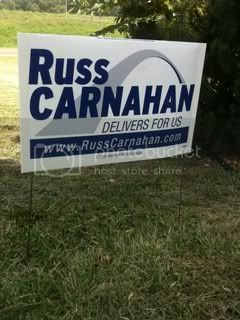 I saw a sign on Union today that said 'Russ Carnahan, he delivers for us.' Let me finish that saying. He helped deliver an $860 billion bailout bail that hasn't worked very well, if at all. He delivered a health care bill most Americans don't like or want. He delivered carmakers, insurance companies and banks to us, the American taxpayer. He helped deliver unemployment, up to 10 percent at it's peak. Yes sir, ol' Russ has really delivered for us in the 3rd District. Maybe we should give Ed Martin a chance to see what he can deliver. Could it be any worse? All of that's spot on, but what's omitted is also interesting. If you're going to use the sub-headline: "Return to sender", shouldn't you also mention Congressman Russ Carnahan's (D-MO) abuse of his franking privilege? I've been following politics forever and I only recently learned about franking, so let me explain what it is. If you want to mail a letter, you put a stamp on it. If a Congressman wants to send you junk mail, they put an image of their signature on it. Originally, they would sign the upper right corner of the envelop, but when you spend north of a $100,000 of your constituent's tax dollars telling them about your exploits in Washington you use a copy machine to avoid carpel tunnel syndrome. 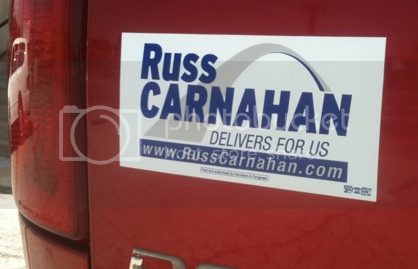 Russ Carnahan's campaign slogan may be "delivers for us", but the postal workers and mail carriers across Missouri's Third Congressional District have been dragooned to "deliver for Russ." I don't think Ed Martin (R-MO) would be as careless with the public's money.